One of the first and important steps of the removal and disposal of medical waste is dividing the different types of medical waste. The reason of this is that a certain method of disposal for one type of waste may not be a good choice or safe and useful for another type of medical waste. The below-mentioned is a breakdown of the different types of bio-medical waste that Glycon generally disposes. According to definition, infectious waste is considered to be any waste products or substances, which are probably to be contaminated or exposed to an infectious virus, bacteria, parasites, and so on. Lab cultures, tissues, and gloves are included in waste products. Taking into account the nature of infectious waste, the waste is very important to be handled properly from the very beginning until it is completely disposed. Besides understanding the requirements of handling and disposing of infectious waste, but Glycon LLC also encourages its clients and their employees to become OSHA certified. Sharps are any device which are used to puncture the skin. Devices such as syringes, scalpels, blades, and needles become a form of biomedical waste after they have been used. It is very important that sharps waste to be handled with extreme carefulness taking into consideration the nature of sharp objects and the possibility of transmitting infectious waste if a contaminated sharp puncture the skin after being used. 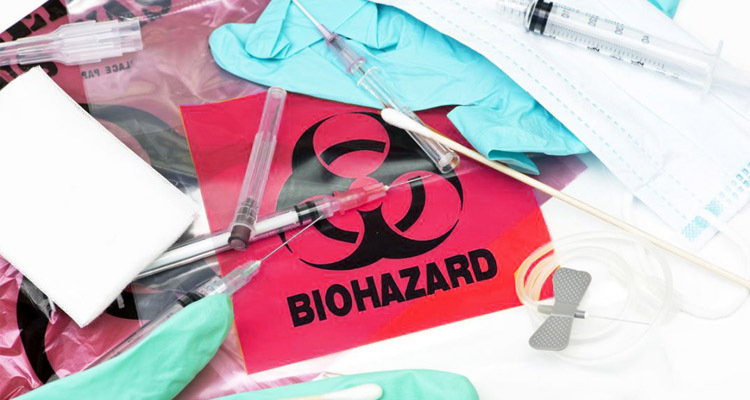 Glycon LLC offers biohazard boxes for the safe and efficient disposal of sharps. Pathological waste can be sorted by as animal or human body parts, organs, tissue, fluids, and items from surgery such as blood and biopsy specimen. This kind of waste must be disposed of in the biohazard container with the RED bag. During the process of disposal most pathological waste is scorched. Chemical waste is not a difficult task to understand. It is any waste which is born by chemicals. Anyway the concept is very simple, handling and disposal can be harmful and very hazardous if it is not done in a proper manner. There exist specific guidelines to follow when disposing of different chemicals. Pharmaceutical waste mainly includes expired and contaminated medications. The expired and/or contaminated medications must be disposed in a proper manner so that they were unavailable to someone who does not need them or contaminate the water supply. Call Glycon LLC Today at (844) 494-8222! If your profession or business use any of the above items, it is important to choose a medical waste disposal company who is aware of the removal, transport, and disposal of medical waste. Glycon LLC is a nationwide company with over 5 years of experience in the industry. We strive to put our customers first while offering schedule flexibility and affordability. Give us a call today to speak with someone about our services and how we can be part of your medical waste disposal solution.